Using data from a trio of orbiting X-ray telescopes, NASA's Chandra X-ray Observatory and Swift Satellite as well as ESA's XMM-Newton, researchers found evidence of a massive "tidal disruption event" (TDE). Tidal forces, due to the intense gravity gradient of the black hole, can destroy an object – such as a star – that wanders too close. During a TDE, some of the stellar debris is flung outward at high speeds, while the rest falls toward the black hole. 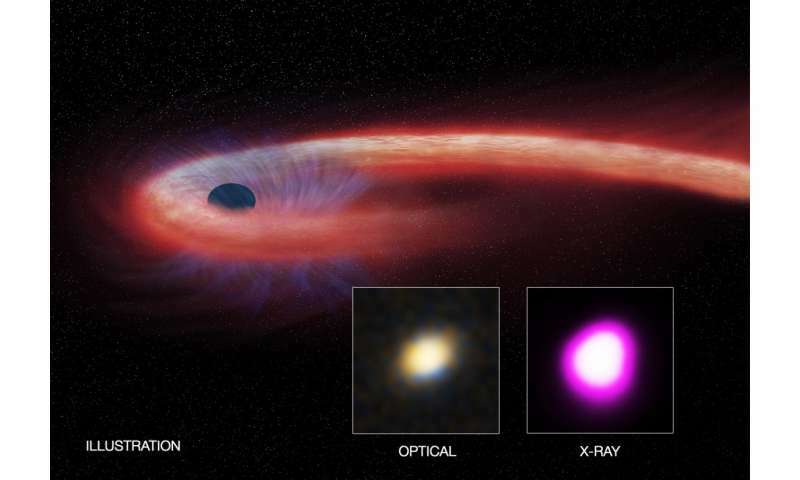 As it travels inward, and is ingested by the black hole, the material heats up to millions of degrees and generates a distinct X-ray flare. We know that feeding black holes have accretion disks. ...........and how do you know this? You have some pics to put up proving this? ........You've OBSERVED all this? How about if you share the pics? Or maybe you know about a secret satellite NASA sent out there at WARP SPEED to transmit all this data back to us at also WARP SPEED? Are electrons real? Depending on how you answer this, please post a pic. Hope this doesn't shatter your world view. Hope it does result in less vitriol. Azrael may have covered this, but doubting that black holes have accretion disks is...well silly. The only way we can detect black holes is by the extreme radiation from their accretion disks. Well some nearby black holes, like the one in the center of the Milky Way, can also be detected by their gravitational effects on nearby stars. And two pairs of black holes merging have been detected by LIGO at distances of billions of light years. Also, measuring the distance from the inner edge of the accretion disk to... Whoops! Can't finish that sentence. The radius and diameter of an accretion disk are infinite. (More correctly the area inside the accretion disk is infinite.) What you measure is the diameter that matches what would be the diameter if it wasn't for the black hole. ;-) Anyway, that gives you the mass of the black hole. Even that require applying general relativity to what you are seeing, usually by a network of radio telescopes.